While ride-sharing may make sense as far as reducing carbon emissions, there is a reason just as compelling for re-examining our love affair with the private, single-driver automobile: saving us from ourselves. According to a report in the Post-Carbon Institute’s August, 2018 newsletter, the world is now in resource “overshoot”; that is, the human population is consuming resources more rapidly than the earth can replenish them. 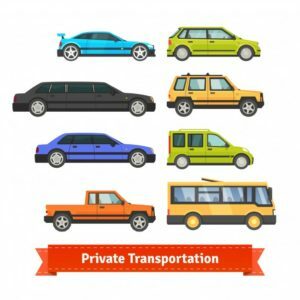 So, let’s take one of the most wasteful and consumptive resource “dumps” on the planet and examine it by the numbers: the private transportation system. Just to put it into perspective, imagine any industry that has invested vast amounts of resource and energy into its operating equipment, yet only uses that equipment two percent of its potential capacity. Any business that operates so wastefully and inefficiently would close its doors the day after it opens. And yet that is the amount we use our cars: at about two percent of their potential. And that’s a generous estimate, at best. Do the math. Let’s consider a typical five-passenger vehicle being operated by one person, who uses it to go to work. Let’s say that that vehicle travels an average of 30 miles per hour. That means that in an hour, it would carry that person 30 miles. The vehicle is capable of carrying five passengers, so in that time it could have delivered 150 passenger miles. Stack that up against the 30, and we come up with the car only delivering 20% of its potential. That’s when it’s in use, of course. Now let’s throw into the mix the down time over, say, a twenty-four-hour period. Let’s say the commute to work takes half an hour. That’s a total of an hour drive time, or 30 passenger miles. Then let’s figure another two hours for personal business. That’s three hours of use, or 90 passenger miles. So, what is that vehicle that, when in use, is only being used to 20% of its carrying capacity, doing the rest of that 24-hour period. Sitting there, doing nothing. Sitting in the parking lot at work, in the driveway at home. Just sitting. Oh, one may say, but it’s not burning fuel for all that time. But that’s only part of the picture. According to Dr. Richard Heinberg, in his landmark work The Party’s Over: Oil, War, and the Fate of Industrial Societies, roughly half of the energy used over the lifetime of that vehicle has been consumed in its production. So, let’s go back to that 90 passenger miles that the vehicle is now delivering for that one person over a 24-hour period, and compare it to its true potential. At 30 miles per hour, that five-passenger vehicle at maximum load could be delivering 150 passenger miles per hour. Multiply that by 24, and we see that that piece of equipment, representing a large investment of resources and energy, could have delivered 3600 passenger miles. Dividing that by 30, we see that the vehicle has only delivered 1/120 of its potential use, or less than one percent. Even if we halve that potential usage, we still come up with 1/60, or less than two percent. What did we say about efficiency rating? We’ve already kicked our liberal two percent to the curb. Now let’s add another factor. We’ve only been discussing automobiles that, as inefficient as they are, are actually being used, even if it is for only a scrimpy part of the day. Now, how about the tens of millions that aren’t being used at all, that are taking up millions of acres of land in car lots? Across the nation, we see dealership after dealership, oversized flags proudly touting their dedication to the “American Way”, hundreds of cars parked in neat rows, stocked so the buyer can have just what he or she wants, instantly, to prevent them from going down the street to the next display of (occasionally) mobile declarations of one’s standing in the community. That’s the new cars. Across that same nation, we see empty lots being turned over to repositories for those castoffs that Madison Avenue tells us are no longer in vogue, don’t sport the latest in technological wizardry to enhance those pitifully scant hours we spend in them. We have long passed the point of vehicular satur-ation, to a point at which we are drowning in an unsustainable automotive overshoot. So how do we close our ears to the incessant exhortations of hood-jumping, rapid-fire, hand-pumping sales reps to hurry on in to dealerships with low or no down payment, low monthly payments, never mind the actual price of the car? Truth be known, if we were to operate more efficiently and with an eye toward a sustainable future, many of today’s wasteful and redundant ways of turning over revenue would fade away. The magnitude of decoupling ourselves from the car culture is daunting, but there are ways we as individuals can get started. Many of us are already taking some of these steps. 1. Change our thinking. This is probably the most difficult, but the most necessary step. We must stop thinking of the earth as an endless source of products to produce and sell to “grow the economy”. The earth does not work in financial terms of perpetual growth. 2. Share rides whenever possible. 3. Consider on-demand services such as Uber or Lynx. These are great steps toward getting more usage out of our cars, reducing production needs. 4. Think about other ways to get around. Other cities around the world are way ahead of the U.S. in bicycle usage, although an increasing number of population centers are incorporating bike lanes in their road systems. Walk wherever feasible and take a collapsible shopping cart if need be. 5. If you must drive, organize your trips to incorporate several stops. 6. Scale down your lifestyle. Tiny homes are becoming a popular option for many wishing to reduce their footprints – and their indebtedness. 7. If adequate public transportation is not available in your area, ask your public officials why it isn’t. And financial shortfalls or lack of “return on investment” are not acceptable excuses. Public services are exactly that, not for-profit enterprises. 8. If you must own a vehicle (and how many of us can get by without it? ), keep it maintained, and for as long as possible. 9. Take a look around you. Go into any discount superstore and look at all the duplication of products, all with their little “tweaks” – but little to affect the product’s performance – to keep in the running with the competition. This is not prosperity or a high standard of living. This is pure waste. 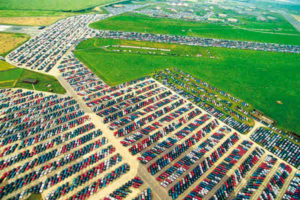 There is one huge, seemingly insurmountable hurdle in our way, and that is the massive amounts of revenue and employment generated by the private automobile: not only the actual manufacture and sale of the vehicles, but the myriad ancillary industries: parts stores, the advertising sector, auto repair and maintenance facilities, the billions upon billions in taxes and license fees, automobile insurance, et al. It is for this reason, and for the fact that technological displacement is unidirectional and continues to eat away at the need for human labor, that not only from the societal aspect, but from the standpoint of ultimate survival, we must adopt an economic system that places sustainability over the exchange and accumulation of philosophical tokens of debt and provides access to responsibly-produced goods and services to all citizens. Technocracy provides the outline for such a distribution system. ← Aren’t All First World Countries Globalists?